Being a vegetarian and unfortunately somewhat of a picky eater, you can imagine I was a bit nervous about what exactly I was going to eat while away in Costa Rica. However, overall I found the food to be interesting but tasty. My host mother Maria Marta was so nice about making a vegetarian version of whatever was for dinner at night, and there was always something for me to eat on the menu when eating out. Although it was fun for the social aspect, eating out every day especially in Nicaragua took a toll on my stomach. I am not used to eating out so often so when we were eating restaurant food daily I was beginning to feel ill by the end of the trip. This being said, I was super happy and grateful for the meals that Maria Marta prepared for us at home. Since I do not eat meat, I found myself eating mainly a vegetarian version of the traditional Spanish meal casado. 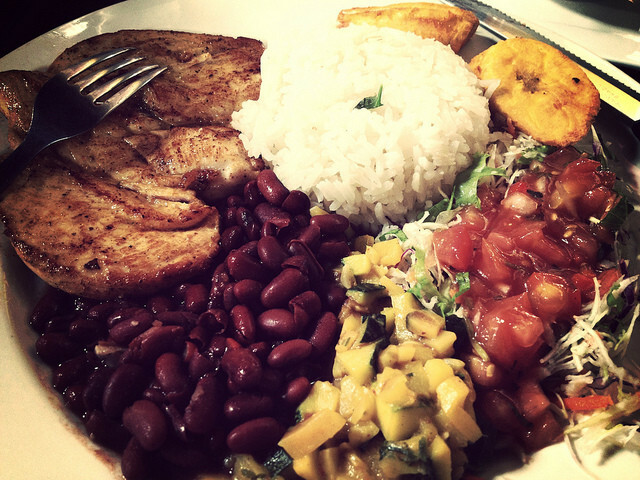 This typically is presented with rice, beans, vegetables, and meat of choice. The vegetarian version was served usually with an egg instead of the meat. It was really tasty and I loved mixing the rice and beans. One thing that I discovered while in Costa Rica is this “salsa” sauce that was really good on the rice and I made sure to buy some to bring home to my family. Another one of my favorites was the coffee. I am a big coffee drinker but have never been able to drink it black until my time in Costa Rica. Everywhere we went it tasted so rich and fresh. The fruit had to be the best thing I ate during the trip and no matter what fruit I tasted I wanted more. All the fruit was so juicy and fresh I wish I could have taken some home with me! Some new things that I tried for the first time while on the trip are papaya, plantains, avocado, and guacamole. I know many people would have already had these things but like I said before I can be picky. I loved them all and I am so glad I for the opportunity to broaden my cultural experience with the new foods and versions of food. Another new thing that I tried was ordering in Spanish. Especially in Nicaragua, many of our waiters did not speak English. Even though before we ordered many of us were pestering Barbara and Michael with “how do you say..” we did give it our best shot. Finally, the US dollar was very valuable in Nicaragua and it made our meals super cheap. Some nights I paid five dollars for my meal and a drink. That is something that one would never be able to do in the United States.